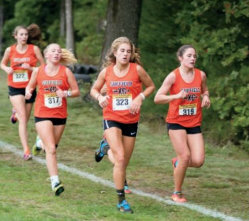 On a muddy and wet course, Isabelle Dutranoit and her Suffield Academy Women’s Cross Country teammates took the line honors in the New England Preparatory School Athletic Council (NEPSTA) Division 2 Cross Country Championships. Ready to put all her summer and fall training to the test, Dutranoit took an aggressive start and battled with other fine racers to grab 3rd place in 19:28. Gabrielle Arcand clocked a winning time of 19:08, with Lara D'Alessandro second with a time of 19:16. Suffield Academy’s Emma Krasemann moved up the pack throughout the race to grab 10th, after a great kick on the track. Jenna Daly pushed herself through ankle pain and outkicked a runner to the line to finish 14th. Emelia Keely pushed the pace up the hills and impressively fended off a competitor in the final 100 meters to finish 16th. All four girls are rewarded with All New England honors for their efforts.